Although the technique is often referred to merely as "acoustic decrepitation", the prefix "baro-" is used to emphasize the fact that the instruments actually detect a pressure change emanating from the sample when it decrepitates. Although sound can be transmitted as either a pressure wave (P) or a shear wave (S), the instrument configuration detects only the P wave and not S waves. Consequently it is technically incorrect to think that the instrument detects sound in general when it really only detects pressure impulses. This distinction is important as it means that the counts observed are only generated by the decrepitation of fluid inclusions in the sample and do not originate from any crystallographic changes in the sample as it is heated, despite incorrect claims to the contrary in some published papers. The key to this important distinction is understanding the construction of the sample tube assembly of the instrument. The sample tube, which is a 15 cm. long quartz tube, is shown in this picture. The sample is placed at the tip (right) of the tube, which will be heated when placed into the furnace, while there is a pressure sensor (microphone) placed at the far end (left) of the tube. The acoustic connection between the sample and the pressure sensor is through 15 cm of air within the tube. This allows the detection of P waves, but S waves cannot travel through fluids, in this case air, and so cannot be detected. Pressure waves are generated when a fluid inclusion bursts open because its internal pressure at the present temperature exceeds the strength of the mineral grain that it is within. This typically requires an internal pressure of approximately 500 bars. For an aqueous inclusion, such pressures can only be attained after the fluid homogenizes to a liquid phase at elevated temperature. Upon bursting, the sudden depressurisation of this superheated water leads to a steam explosion which generates a pressure pulse which is transmitted through the air to the pressure sensor and counted. 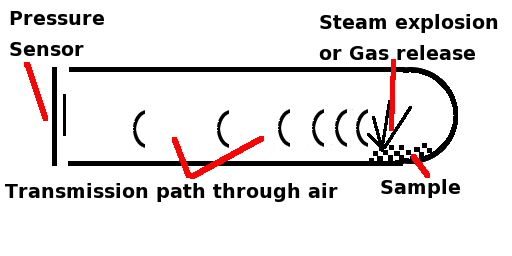 Gas rich inclusions typically have high internal pressures at room temperature and pressure increases further in accordance with the gas law (see detailed explanation) when heated. When these inclusions burst, the release of high pressure gas and superheated water both contribute to the generation of a pressure pulse. However, when crystallographic changes, such as twinning rearrangements or the alpha to beta phase transition in quartz, occur they cause only small volume changes which then cause only minute pressure changes in the air in the sample tube. These pressure changes are so small that they are well below the instrument threshold and are not counted. Crystallographic changes do generate significant S waves, but these cannot travel through the air and are not detected by the pressure sensor at all. To detect these S waves you need to use a completely different type of microphone and to have a transmission path through a solid all the way from the sample to the detector. The deliberate use of an air path in the instrument completely eliminates interference from crystallographic changes as the sample is heated. 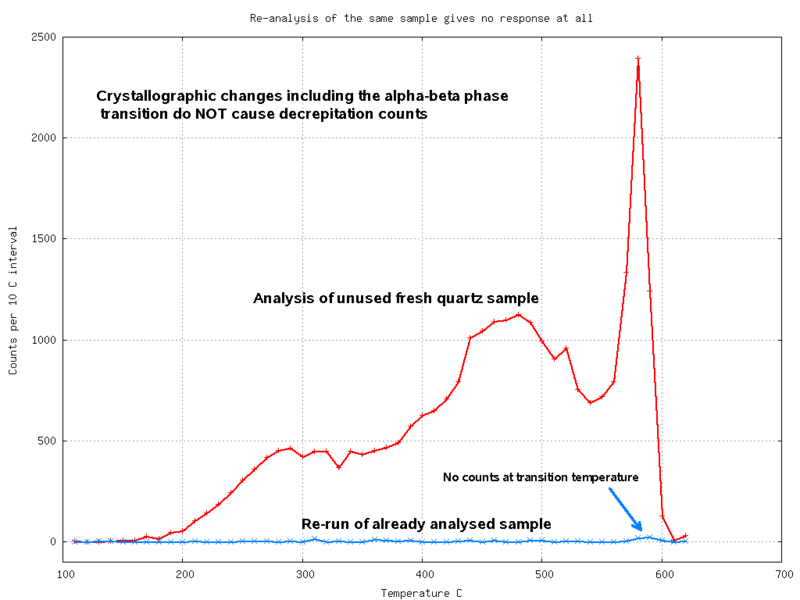 The immunity from crystallographic transition interference is clearly shown when quartz samples are heated through the alpha to beta phase transition at 573 C. At this transition quartz changes its structure and the beta phase has a slightly larger unit cell volume. This phase transition is rapid and cannot be "frozen in" as a metastable phase when the quartz is cooled back below the transition temperature. When "sterilized" quartz is heated through the transition temperature, no decrepitation counts are detected, confirming that crystal phase transitions do not generate detectable decrepitation counts in the instrument. Note that all known decrepitation instruments since about 1975 use an airpath and pressure sensor detection and are immune to crystallographic change interference. Only a few early Russian decrepitometers used a solid transmission path which allowed the detection of S waves and almost no data from these instruments is available. It seems their use was quickly discontinued, perhaps because of this interference problem. I use the term "sterilized" quartz to refer to quartz which has already been heated well beyond the transition temperature and cooled back to room temperature. This procedure eliminates any fluid inclusions from the quartz which might generate counts as they decrepitate. This is necessary because any fluid inclusions present at the transition temperature can burst because the quartz strength decreases dramatically during the phase transition, encouraging the decrepitation of even low pressure inclusions. (Detailed explanation here).